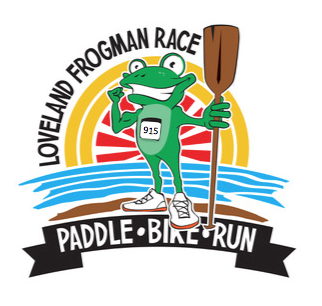 Join us for the 5th annual Frogman event! or individually (use a kayak). and as an individual is 16 years old. The race will begin at 8:30 a.m. with a staggered start. Registration/Check-in will begin at 7:30 a.m.
Packet Pick up will be at JackRabbit Running Store of Loveland on Friday, September 13. 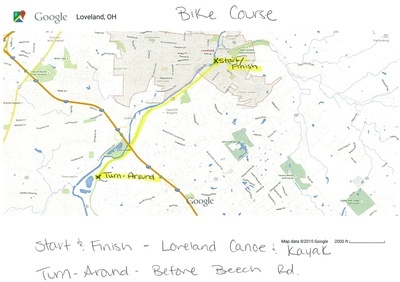 Race will begin and end with all transitions at Loveland Canoe & Kayak (174 Karl Brown Way). All participants will be bused to start line (Carl A. Rahe Access). Singles in kayaks will start the event, followed by team canoe divisions. Event t-shirts will be available for purchase (pre-order only) for $20 each. 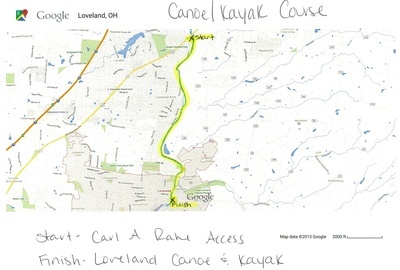 Canoes, kayaks, life jackets, and paddles will be provided. Participants are to provide their own bicycle (road bike is recommended). Life jackets must be worn at all times while on the water. Bike helmets must be worn at all times while on your bike. No headphones are allowed during any portion fo the race. Failure to comply with the safety rules will subject contestants to disqualification. A photo ID is required and waiver must be signed and submitted in order to receive your race packet and bib/timing chip. This is a rain or shine event and there are NO refunds. In the event of severe weather the start may be delayed and the course may be altered for safety reasons. Please respect your fellow participants. There will be all types of skill levels competing so please stay aware of your surroundings at all times. Bike's can be rented locally at Loveland Bike Rental and Montgomery Cyclery. 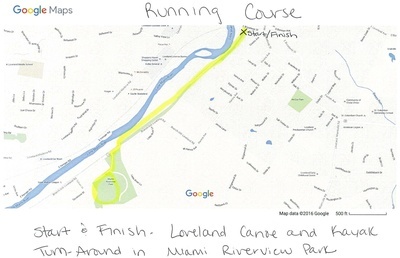 This race can be used as a Warm-up to Morgan's Little Miami Triathlon. Early Bird Discounts available for registrations prior to August 16.